Frenchman Bay or Frenchmans Bay, according to locals, is positioned between Schoodic Peninsula on the east and Mount Desert Island on the west. 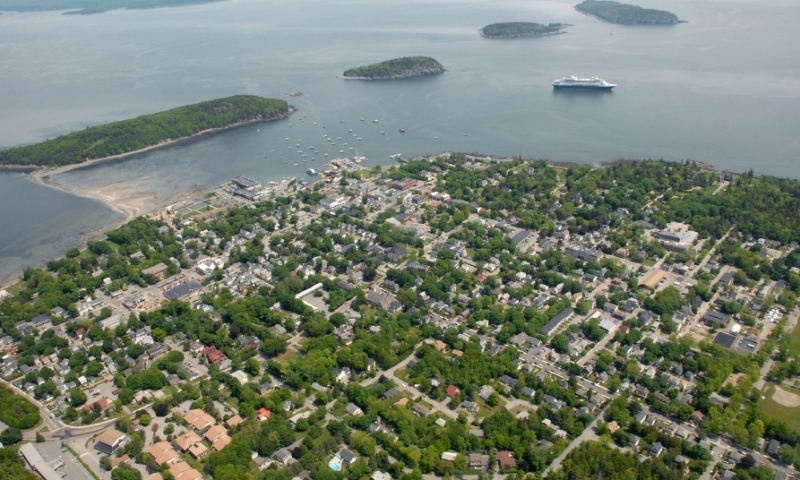 Bar Harbor is the largest town on the bay. 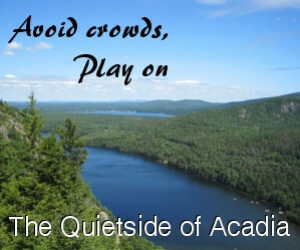 Yet, the bay contains many islands and is well known as the scenic, busy harbor gateway to Acadia National Park. 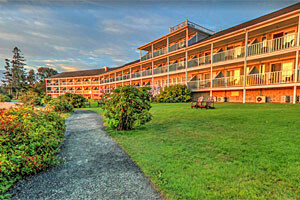 In the heart of downtown Bar Harbor and minutes to Acadia National Park. Our oceanside hotel offers amazing dining, libations, spa, and is along the Shore Path system. 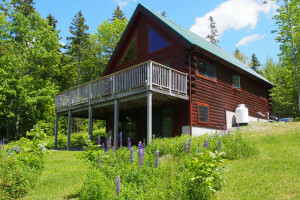 Select from 6 wonderful vacation cottages and homes on Mount Desert Island overlooking the Bay, all with great views of the ocean and direct access to the waterfront. 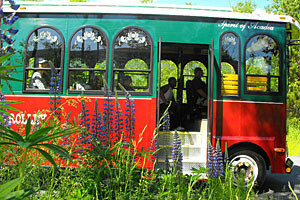 Providing trolley tours of Mt. Desert Island including Cadillac Mountain, Acadia National Park and the sites around downtown Bar Harbor. Great for all ages. 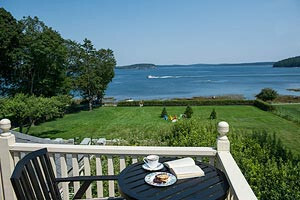 Our luxurious oceanfront Bed & Breakfast overlooks Frenchman's Bay where you can walk to restaurants, shops, galleries and downtown Bar Harbor attractions. Book Online. Views from the water include the pink granite of Cadillac Mountain, Champlain Mountain, Schooner Head, Great Head, and Otter Cliffs and the wooded Schoodic Peninsula to the east that frame the bay. Egg Rock lighthouse marks the entrance to the bay. To the north can be seen the Porcupines islands, Ironbound, and Grindstone Neck. Cliff caves, nesting sea birds and ocean life amongst these islands and their narrow passages are characteristics of the uniqueness of Frenchmans bay. You can enjoy the views from land by sitting on the shore and taking in the sights. Hiking one of several trails, like the Bar Harbor Shore Path, that offer breathtaking panoramic scenery, will not disappoint as the rugged beauty of the Maine Coast unfolds before you. 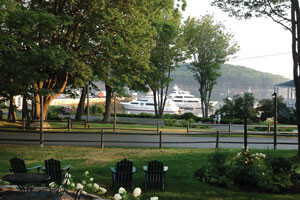 Many lodgings in Bar Harbor also offer views of the bay. You will be able to observe various sea birds, Bald Eagles, Peregrine Falcons, Hawks, and other marine wildlife in their natural environment. 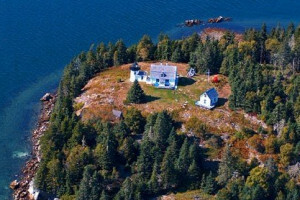 In addition, there are a number of beautiful summer cottages lining the shores of Mount Desert Island. Salt water fishing is one activity popular in the bay and Maine does not require a license to fish in salt water, however a registry is being implemented, new in 2010, and anyone recreationally fishing in salt water in Maine should check to see whether they must register with the National Saltwater Angler Registry. Registering is free and can be done online. You can fish in Acadia National Park. Some suggested areas are, Sargent Drive, Somes Sound, Frazer Point and the Schoodic Peninsula. It is advised to be cautious while fishing along the coastline as large waves can unexpectedly hit the shore and the coastal rocks are extremely slippery. Pier fishing in Bar Harbor is also an option. Always check with the park service, or local municipalities for seasonal restrictions. Other than fishing, common activities include sailing, boating, boat charters, tours and cruises, or sea kayaking. As with any Northern climate ocean activity, the waters of Frenchmans bay rarely exceed 50 degrees Fahrenheit. If participating in adventure sports such as kayaking, please have appropriate equipment such as insulated suits to protect from hypothermia. Named for Samuel de Champlain, the French explorer who explored the area in 1604, this area was apparently a favorite for the prehistoric Native Americans who called this region home. Many Native American artifacts have been uncovered on the various islands in the Bay as several hundred shell heaps have given insight into this summer destination of Wabanaki tribes.